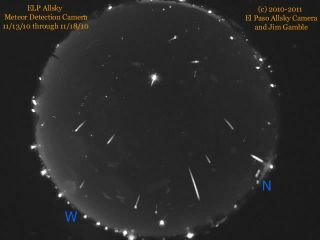 Skywatcher Jim Gamble of El Paso, Texas created this composite image of the 2010 Leonid meteor shower display using an allsky camera. The Leonidmeteor shower of 2010 may not have dazzled, but it still caught the eyes of die-hardskywatchers who awoke before dawn today to catch the moderate shooting starshow at its peak. "Notthe best show ... but respectable," Gamble told SPACE.com today. The Leonidmeteor shower returns every year in mid-November. It occurs when the Earthpasses through a stream of dust leftover from the Comet Tempel-Tuttle. Thematerial hits the atmosphere and then flares up as "shootingstars." This year,however, the Earth is passing through a less dense part of the comet debrisstream, astronomers have said. The Leonidmeteor shower of 2010 promised between 15 and 20 meteors an hour forskywatchers graced with clear skies, according to predictions from meteorexperts. The best time to observe the show was in the hours before sunrise onWednesday (Nov. 17) and today. Internationalmeteor counts have officially pegged this year's Leonids at less than 25meteors an hour, according to the website Spaceweather.com, which monitorsspace weather and skywatching events. Still, thepromise of only a modest meteor show did not dissuade avid meteor gazers. InJerusalem, skywatcher Yaron Eini made it a group event, but was sureeveryone bundled up warm while observing. "We hada nice weather for this season," Eini toldSpaceweather.com. "It was comfortable for us to lay down in oursleeping bags and enjoy the modest Leonids meteor shower." The nextmajor meteor show for skywatchers will be the Geminid meteor shower, which willpeak on Dec.13 and 14.